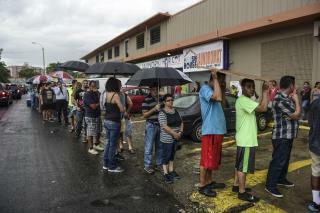 (Newser) – Cheers erupted as lights slowly began to flicker on across Puerto Rico overnight as the US territory struggled to emerge from an island-wide blackout following a fire at a power plant that caused the aging utility grid to fail. More than 390,000 of 1.5 million homes and businesses served by the power utility had electricity restored by late Thursday, with cries of, "The lights are back on!" echoing through some neighborhoods. Gov. Alejandro Garcia Padilla says he expects more than half of customers to have power by Friday morning, and 90% by Saturday, though he admits problems may arise, the AP reports. I'm sure Chicago wishes they can get a few blacks out too.. There was a time when terrorism in America was related to Puerto Rican independence groups. Let them go, revoke all their American citizenships, and let them make for themselves what they can. There's going to be a huge population boom in 9 months. PR has a lot of economic problems. Most of the island is a ghetto.